Only in Snow Trend Top-Grain Leather. Last Piece on the floor. RELAXER – Introducing the next generation of supremely comfortable, sleek and sophisticated recliners that deliver a modern day alternative to their old fashioned, over stuffed predecessors. All superbly crafted inside and out. 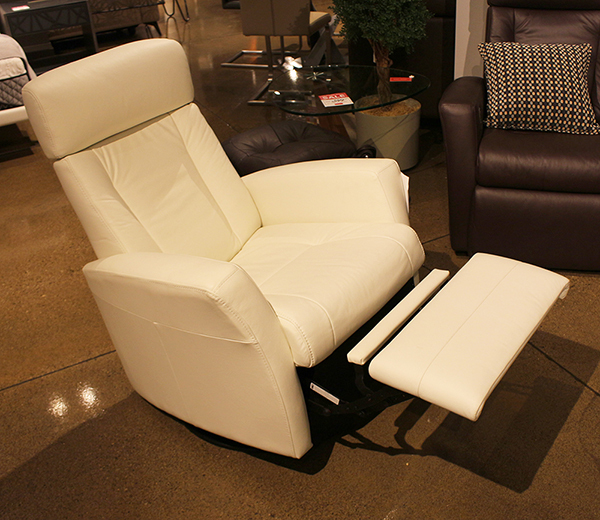 The integrated footrest is easily brought up, by pulling a lever between the right arm and seat. This is great for relaxing in small spaces. The chaise with extra padding gives additional comfort. The IMG exclusive head and neck adjustment system allows your head and neck to rest in an infinite number of comfort positions. Some of our motion sofas are also equipped with a height adjustable neck support system that allows you to adjust the height of the headrest, regardless of reclining position. Many designs are available in two or three sizes for the perfect fit! 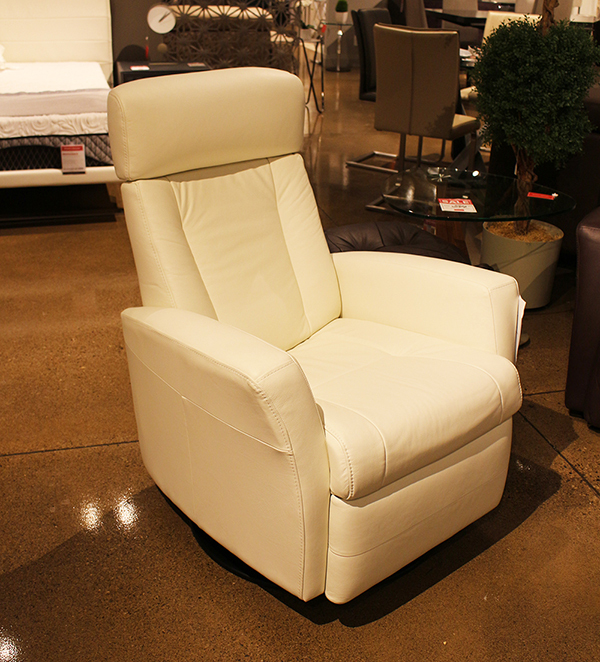 If you like gliding, this chair is perfect for you. When you prefer the no-glider function a glide-lock lever can be found at the back of the relaxer. This chair swivels as well. 10 years on molded foam cushions and steel frames. 2 years on motor battery-parts plus leather and fabric covers.